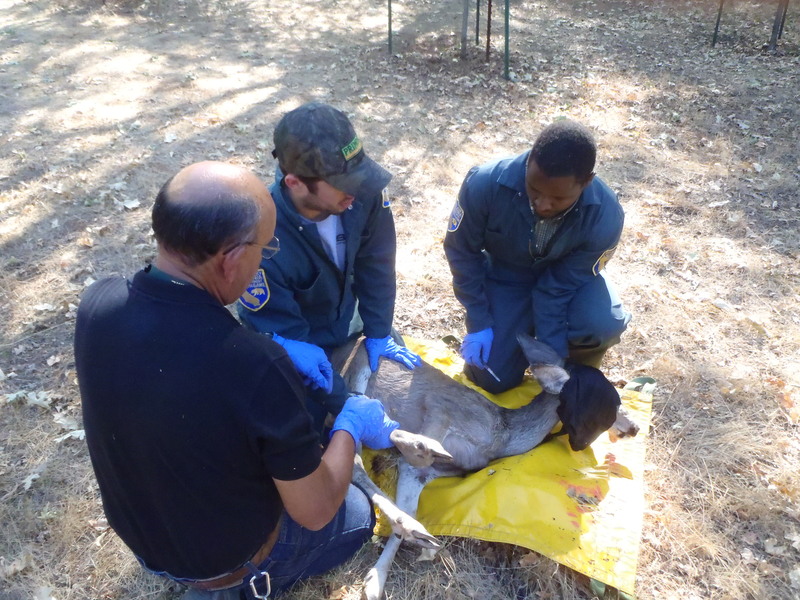 Earlier this month, the Wildlife Investigations Lab (WIL) received a call from a landowner near Placerville regarding a resident mule deer (Odocoileus hemionus) that frequented his property. The landowner said the deer, an adult female, was wrapped in some kind of wire that was restricting her ability to walk. WIL Veterinarian Dr. Ben Gonzales decided we should take action. Another scientific aid, David Mollel, and I gathered wildlife restraint equipment and the three of us departed headquarters. Dr. Ben Gonzales helps keep the deer cool post-capture by applying water from a hose. Chemically immobilized animals can lose thermoregulation ability after being darted – it is therefore important to keep animals cool or warm depending on the surrounding temperature. by her side while she struggled to walk and browse on vegetation. Dr. Gonzales determined the best option would be to chemically immobilize the doe via dart projector. This would allow us to safely remove the wire from the deer while also limiting the amount of stress on the animal. After Dr. Gonzales successfully darted the deer, we followed her movement until the drugs took complete effect. After a few minutes, we loaded her onto a carrier and brought her into a flat shady area near a pile of firewood. The tomato cage was quickly and effortlessly removed from her legs. Our work was not done however. Sci Aid David Mollel prepares to administer the reversal agent while Dr. Ben Gonzales and I continue to monitor the deer. Each time an animal is chemically immobilized, it is essential to follow protocol to ensure the safety and well-being of the animal during post-capture. These steps include opening the airway, monitoring heart and respiratory rate, protecting the eyes and assessing thermoregulatory ability. 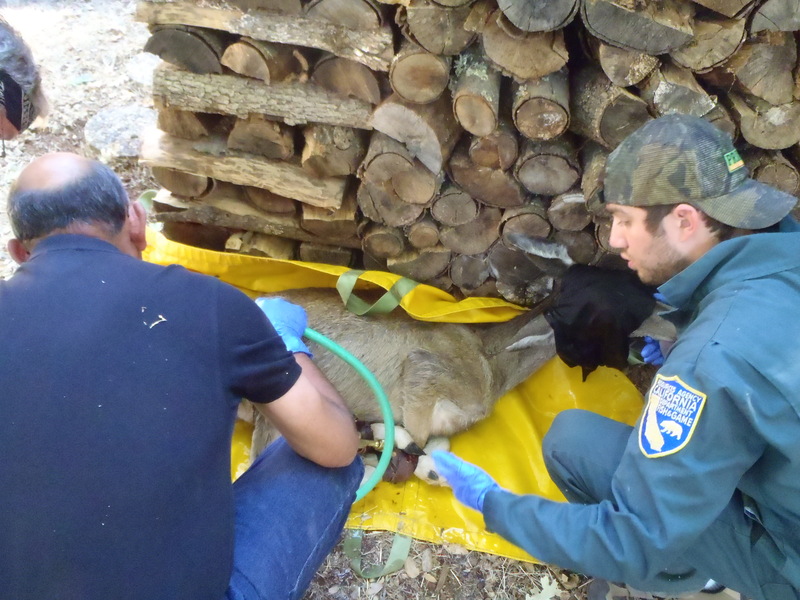 The doe was given a reversal agent (which prevents the immobilizing drug from applying its action), was able to recover from the capture and walk off with her two fawns. This event is a classic case of human-wildlife conflict. Greater than half of California is considered deer habitat. People have been moving out and settling in deer habitat for many years. When human and wildlife populations overlap, it increases the likelihood of interaction between people and wild animals. While this can be great for wildlife viewing from your back porch, it can negatively affect wildlife by making unnatural food and shelter available to them. In this case, the deer got into someone’s garden, most likely causing property damage, and became restrained by a mess of tangled wire. Situations like this are preventable. The Department of Fish and Game has plenty of tips and information through our Keep Me Wild campaign. Keep Me Wild is a program dedicated to educating the public on how to prevent wildlife – such as deer, black bears, mountain lions, and coyotes among others – from accessing human food sources. CDFG also offers tips on how to keep deer out of your garden with The Gardener’s Guide to Preventing Deer Damage, as well as a list of available products that help keep wildlife away from human food sources. By following these tips, we can hopefully ensure that California’s wildlife remain how nature intended them to be: wild! A picture is worth a thousand words … wonder what this little desert kit fox has to say about the monsoonal summer in California’s Colorado Desert? 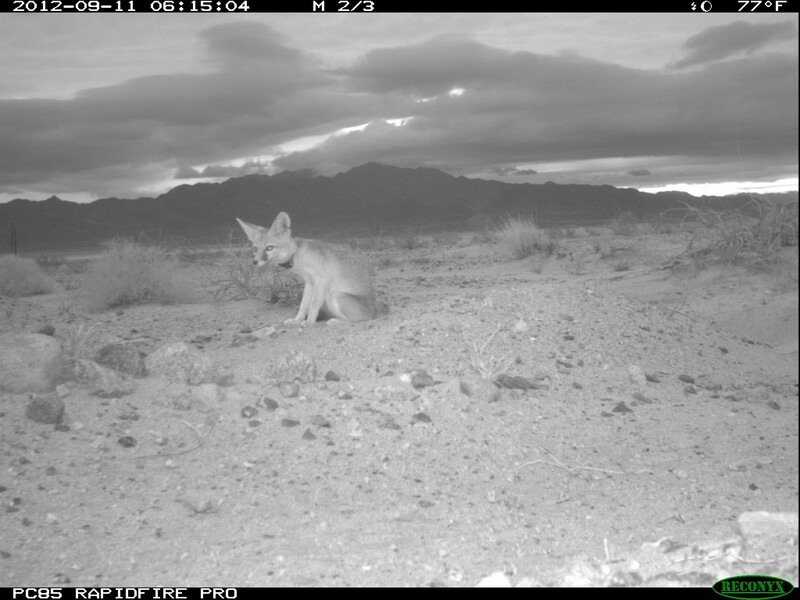 More information about the desert kit fox project can be found by following the link. This radio collared desert kit fox (Vulpes macrotis) is part of an ongoing disease monitoring effort in eastern Riverside County. Remote cameras are placed at kit fox dens and used to capture still images of its inhabitants. This is a useful, non-invasive tool biologists can use to monitor the health and physical condition of these crepuscular animals. Photo courtesy of David Elms from Region 6 DFG office.